The Huff N Puff on the Bluff 15k was Saturday, March 12, 2011 in downtown Sheffield, AL. This is a difficult 15k course. There are some difficult hills, especially on the last half. This race draws a fast crowd from North Alabama at the front. The overall winner was Josh Whitehead in an amazing and near course record 48:54. The female winner was Sandy Lynch in 1:04:43. The masters winner was Scott Strand in 50:09. The female masters winner was Lori Goldweber in 1:08:08. The overall results and the age group results are at the Shoals TRAC website. There were several Limestone County finishers listed below. 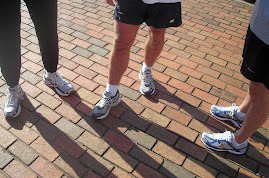 The annual Spring 10K Road Race at UAH was Sunday, March 6, 2011 at 2:00 PM. There is some irony in the name of the race today because the conditions were not very spring-like! Temperatures were in the low 40s with a strong breeze from the north under cloudy skies. Brrr! There were several Limestone County runners who participated in this race. The full results are available at the HTC Website. View the overall results and the age group results there. Limestone County finishers are listed below.